Islay's Whisky - "Uisge Beatha"
When I first visited Islay I was blissfully unaware of how this island was steeped in the tradition of whisky making. Then I would not have considered myself a whisky devotee, but over the years I have become captivated by both the taste and smell of Islay through it's whiskies. Moreover, I have formed an appreciation of the close link between the rivers, lochs and whisky. I enjoy casting a trout fly upon the self same waters which richly contribute to the Islay malts : Truly the "water of life" or "Uisage Beatha" in the Gaelic. 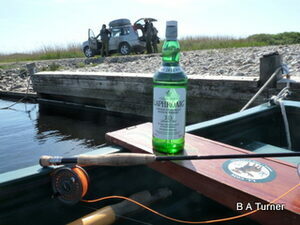 Here you will find Islay's whiskies and my personal link to trout fishing waters. I love the lochs our native brown trout frequent, but now appreciate even more the water which is so much part of the Islay whisky making process. In Jura too, the whisky and the loch I have visited often over the years are, to my mind, inextricably linked. With both Islay and Jura whiskies some of the connections are obvious as they take their water from the loch itself. In others, I feel that their character matches so much with the particular stretch of water and some have a straightforward geographical alignment. Please excuse this personal romantic vision of the whisky, water and fish which creates for me Islay's enchanted aura and is the reason I keep returning. Ardbeg of course has its link with Loch Uigeadail, the loch which provides Ardbeg's water and the Uigeadail range of whisky. Look out for this expression, it is rather good - as is the Ardbeg coffee shop! From Bowmore, our water source is the River Laggan. It is famed for it's Salmon fishing and is one of Islay's main rivers where there are trout to be found too! I enjoy the 12 year old "Enigma" but there are many other good bottlings in the range to sample. Go over Loch Indall to Bruichladdich and you will find a great distillery to visit with a fantastic array of whiskies to try. My fishing water link here is Loch Gorm where you can find a fish or two wherever there are rocks and skerries. Try Bruichladdich "Rocks" it is a fine dram at an affordable price. I also purchased and enjoy the "An Turas Mor" from the Port Charlotte stable. Bunnahabhain sits on the Sound of Islay, looking over to Jura. It is a wonderful location to visit, where you can enjoy both the view and the whisky. Water from the Margadale River contributes to this lovely whisky taste and if you look beyond the head of the river you will see Loch Smigeadail, a beautiful and remote loch. The question is "are there trout contained therein"? It's a mystery I have still to unravel. I am currently enjoying the Darach Ur bottle, but it is unfortunately only available at travel outlets. Mine was a purchase at Edinburgh Airport this summer. Just next door and also on the Sound of Islay is Caol Ila, another distillery with a stunning view and location. Linked with Lagavulin, this peaty whisky takes it water from Loch nam Ban, a small loch on the Bunnahabhain road before Loch Ardnahoe. You will not see this loch from the road but it contains a wee trout or two. Try the Caol Ila Cask Strength expression for a smokey kick. Kilchoman is a newcomer on the Islay whisky circuit and is just bearing fruit. Near Loch Gorm and Machir Bay, the water comes from a spring on Octofad Farm so no chance of casting a fly for trout here. I have the Machir Bay release and most enjoyable it is too. It is a peaty malt which I am going to link with a fair peaty water such as Loch Drolsay where a nice trout could be waiting for you - but not too many! Look out too for their new Loch Gorm release - fish it and drink it! Are you, like me, a "Friend of Laphroaig" down on Islay's south coast on distillery strip? Its water source is Kilbride Dam at the head of Kilbride River. It is not a fishy spot, but the water makes what is a world famous whisky. I really can't go past the "Quarter Cask" and, given the range of awards it has received, you should try it too. Fishing on Loch nan Gillean (The Gillie Loch) my tenuous link here is a Royal connection as Laphroaig is a favourite of The Prince of Wales. However, unlike myself, Prince Charles will have his attentive Gillie whenever he casts a fishing fly. Our last Islay whisky is Lagavulin, sandwiched between Ardbeg and Laphroaig. It may be sandwiched, but what a filler! A visit here is a must and the dramming room is devine! The water source is the Solum Lochs. Although, I have not fished here, when surveying the scene from the top of the hill, south of Loch Leathan an Sgorra, the landscape of these southern distilleries, including Lagavulin, can be appreciated. Currently I am enjoying the 12 year old version which was a welcome birthday present. To close this personal whisky tour I travel over to Jura and to Craighouse, the home of Isle of Jura whisky. Before the village on the left you can see the beautiful waterfall coming from Loch a Bhaile-Mhargaidh (The Market Loch) on the hillside. It is a good trek up to fish this loch, but well worth it with some nice trout if your luck is in and the wind not too strong. This is where Jura distillery takes it water. In my whisky collection at the moment is Jura 16 year old Diurachs' Own which takes me back to the banks of the Market Loch on a long winter's evening.